This article is about the tabletop RPG in the Yu-Gi-Oh! manga and Toei anime. For the Yu-Gi-Oh! Duel Links event, see Tabletop RPG: Monster World. 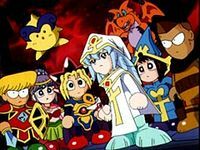 Monster World is a tabletop RPG (Role Playing Game), similar to Dungeons and Dragons, from the manga, which also appears in the Toei anime. The board is Bakura's custom 10x20 setup, including a town, forest, and castle areas. The Dark Master plays the monsters and the "boss" of the adventure. The adventurers try to defeat the Dark Master. Bakura used his computer to enter the character data. In areas where monsters appear, Bakura rolls two ten-sided dice, to get a number from 0 to 99. If the number is less than the probability of a monster appearing, a monster will appear. The monsters are stronger the lower the number rolled. If a player rolled a 99 (critical fumble), or Bakura rolled a 00 for Zorc (supercritical hit), the player would be trapped inside their character's miniature. "Millennium Enemy 1: The Mysterious Transfer Student"
"Millennium Enemy 2: Monster World"
"Millennium Enemy 3: The Fumble of Doom"
"Millennium Enemy 4: Role-Playing Miniatures"
"Millennium Enemy 5: Stop the Run of Criticals!" "Millennium Enemy 6: The Traps of Zorc Castle"
"Millennium Enemy 7: I'll Fight Too!" "Millennium Enemy 8: Fight! Fight!!" "Millennium Enemy 9: The White Wizard Bakura"
"Millennium Enemy 10: The Last Die Roll"
"A New Development - Attack of the Handsome Boy"
"Rival Clash - The Greatest Crisis"
"Friendship - From Legend to Myth"
This page was last edited on 16 March 2019, at 13:36.